1100 W power pack extra long life motor with external access to carbon brushes for quick replacement. With vertical drill stand, it converts into highly accurate Bench drill. Can be attached to the magnetic drill stand for elevated applications. Ideal for maximum capacity heavy duty drilling and as a driving unit for cylinder honing equipment in structural engineering works, rail work shops, shipyards, etc..
KPT 23mm Morse Taper Drill, HD1115MT is a premium quality Bench Drills from KPT. 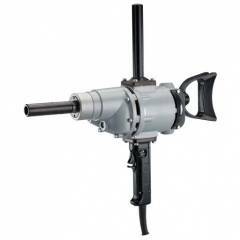 Moglix is a well-known ecommerce platform for qualitative range of Bench Drills. All KPT 23mm Morse Taper Drill, HD1115MT are manufactured by using quality assured material and advanced techniques, which make them up to the standard in this highly challenging field. The materials utilized to manufacture KPT 23mm Morse Taper Drill, HD1115MT, are sourced from the most reliable and official Bench Drills vendors, chosen after performing detailed market surveys. Thus, KPT products are widely acknowledged in the market for their high quality. We are dedicatedly involved in providing an excellent quality array of KPT Bench Drills.